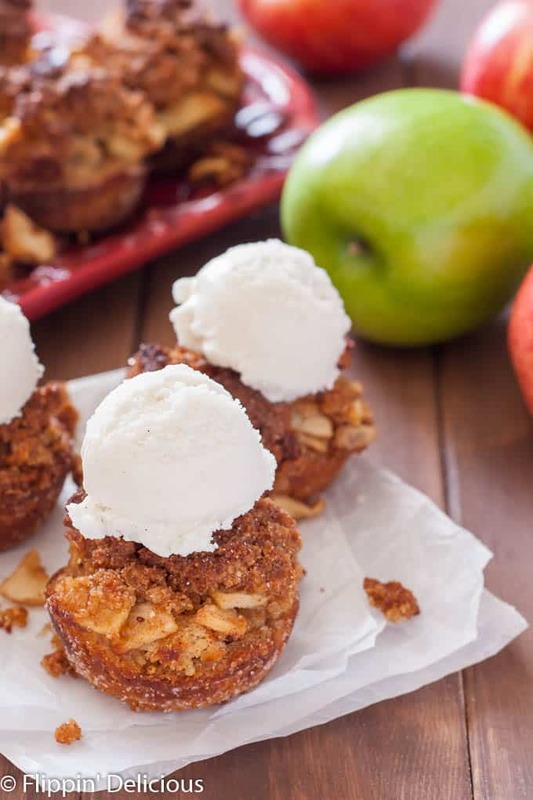 Gluten Free Apple Brown Betty Cups take the classic dessert to a new fun-portable place. The perfect sweet and buttery fall apple dessert! This post is sponsored by Canyon Bakehouse. As always, all opinions are entirely my own. Thanks for supporting Flippin’ Delicious™ and the companies that I work with! Apple Brown Betty is a classic fall dessert made with buttery bread crumbs, chopped apples, cinnamon, sugar, and LOTS of butter. 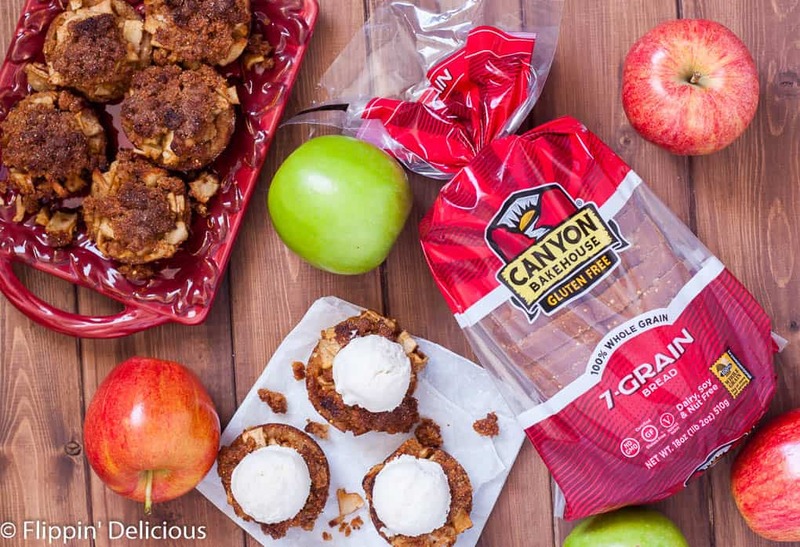 It is easily made gluten free using Canyon Bakehouse’s gluten-free 7 grain bread. 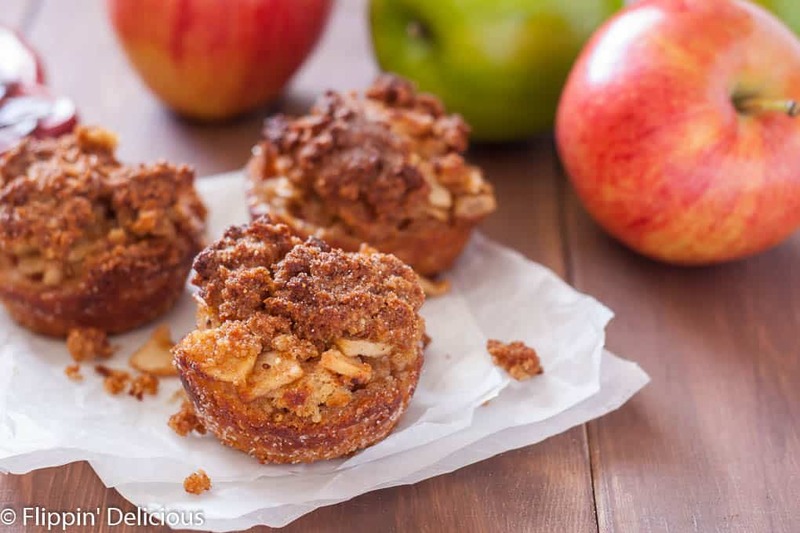 Even better than a full-size gluten free apple brown betty are these super cute gluten free apple brown betty cups! I slightly flattened each slice of bread with my rolling pin, cut out a round, and then dipped it in cinnamon sugar before pressing it into a muffin tin and filling it with apples. The sugar caramelizes a bit while it bakes resulting in a tantalizing crispy chewy crust. 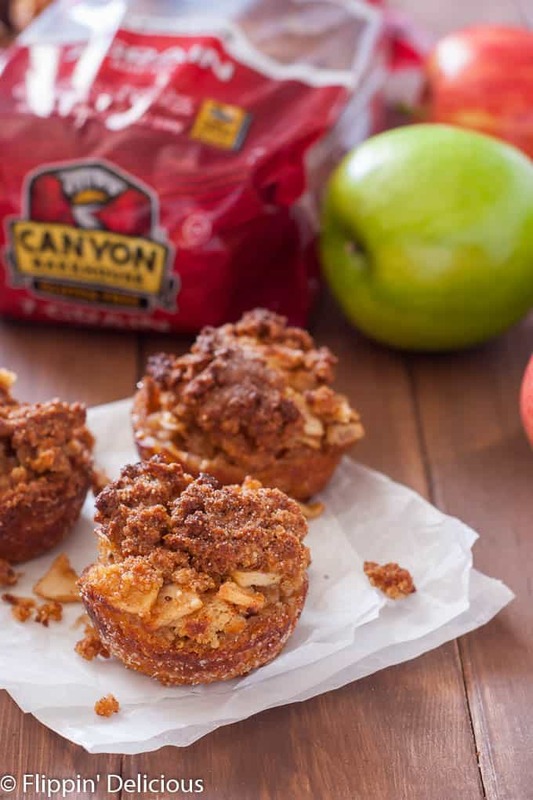 Each mini gluten free apple brown betty gets topped with buttery bread crumbs (made from the crusts) and a little extra cinnamon sugar. Add a scoop of ice cream and you have the perfect individual desserts for any fall occasion! If you are looking for a grain-free alternative apple dessert, I think you’ll love Texanerin’s Paleo Apple Crisp. It is on my baking list for this fall. Whenever I start to peel apples for an apple dessert I think of my high school piano teacher, Mrs. L. She was a HUGE influence on me as a teenager, and was a surrogate grandmother of sorts. Not only was Mrs. L a piano teacher (and a voice teacher) she was a super spunky 80+ year old Catholic farmer in a local small farming community. Her family had come from Italy and she had inherited their family farm. She lost money every year running the farm and apple orchard. She could barely hobble around since she could no longer stand up straight but that didn’t stop her. She ran the farm on principle. Farms were what started the little village that she lived in, and she wanted them to remain an integral part of the community. Every piano lesson I learned much more than my scales and chords, or classical composers and the best musicals. Every lesson I learned the value of life, the importance of the environment, how to work hard, and how to be a good person. I came away from each piano lesson with a better understanding of the world and my local community. One fall I helped her run her booth at the local harvest festival, selling her apples, jams, jelly, and pie. I actually spent the night at her home so that I could help her make her infamous apple pie. It was something that everyone looked forward to every fall. She would spend hours the evening before sitting on her back porch peeling apples with a paring knife and tossing them into a 5 gallon bucket. One bucket for the peels and one bucket for the apples. The next morning I woke up with her at 3 or 4 in the morning to help her roll our the pie dough, fill her pie with apples and other fruit, and then bake it before the harvest festival began. Mrs. L had such an impact on me, and set such an example for me of what kind of person I wanted to be, that I named one of my daughters after her. Preheat the oven to 375F and lightly grease a muffin tin. Lightly flatten each piece of bread with a rolling pin and cut a 3-3.5 inch round out of the slice (SAVE THE CRUSTS). Mix together the cinnamon and sugar in a small bowl. Lightly spray each round of bread with cooking spray on each side and dip in cinnamon sugar to coat. Then gently press each round into the prepared muffin tin. Toss all of the ingredients for the filling together with 2-3 tablespoons of the bread crumbs, and divide between the 12 muffin cups. In a small bowl mix together the melted butter (or vegan butter), the remaining bread crumbs, and ¼ cup of the leftover cinnamon and sugar. Sprinkle the mixture over the apples. Bake for approx 40 minutes, or until the apples are tender and the top is golden. If the topping starts to brown too soon just cover your pan with aluminum foil. Let cool before removing from the pan. Serve with ice cream, if desired. YAAAAAAS GIRL! Thank you for this killer holiday recipe! Whoa! These look AMAZING!!! Especially with that ice cream on top! I ate them for breakfast! With ice cream too. This looks amazing. Can’t wait to make them! 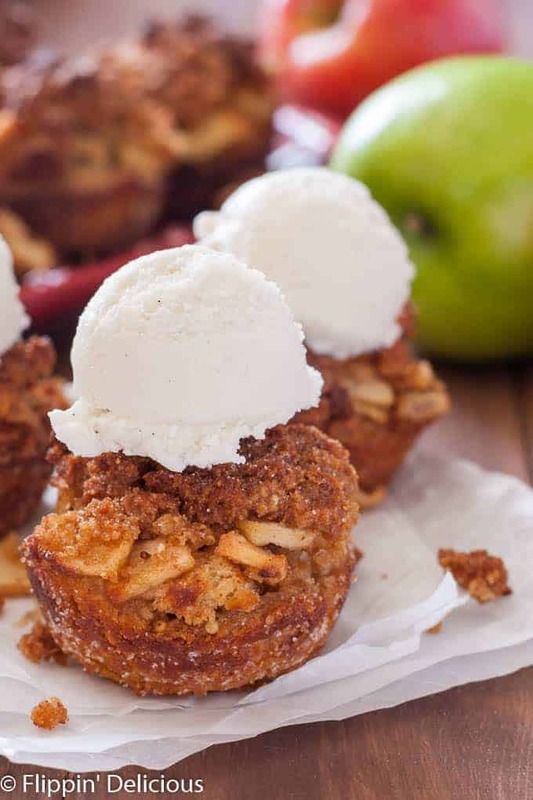 I haven’t made an Apple Brown Betty in years but this makes me want to make it right now! Yum! These look so good! I love anything apple. Thanks Judy! Apple is a great fall flavor.